O.A.R. (aka Of a Revolution) converted from a local Ohio State University rock band to Billboard chartbuster and headliner at major venues across America. First, the band’s two demo recordings were hawked at universities. Then, word-of-mouth news spread about the band’s roots rock and reggae-inflected upbeat songs. Before long, the band got thousands of hits daily on its website at www.ofarevolution.com. 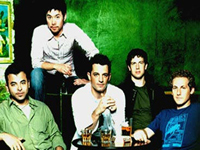 O.A.R.’s third CD, Risen, was produced by John Alagía (Dave Matthews Band, Ben Folds Five) and recorded in summer 2000 at Water Music in Hoboken, NJ, and at Dumbo Studios in New York City for the group’s independent label, Everfine Records. Formed in 1996 in Rockville, MD, O.A.R. coalesced around lead singer/rhythm guitarist Marc Roberge, lead guitarist Richard On, saxophonist Jerry DePizzo, bassist Benj Gershman, and drummer Chris Culos. Roberge had known Culos since childhood in Rockville, MD, where he also became friends and played in local bands with On and Gershman. DePizzo, who hails from Youngstown, OH, met the others at Ohio State.